Thomas J. Walker is the primary source for the following information. Calling males are wide spread from ground level to tree tops. Juveniles and feeding adults occur in grassy areas; overwintering adults occur in thickets and woods. Season: Outside of east Texas, this is the only conehead that overwinters as an adult and starts singing in spring. Burk, T. 1982. Evolutionary significance of predation on sexually signalling males. Florida Entomologist 65(1): 90-104. Capinera, J.L. & R.D. Scott, T.J. Walker. 2005. Field Guide to Grasshoppers, Katydids, and Crickets of the United States. Cornell University Press, Ithaca, New York. 280 pp. Helfer, J.R. 1962. How to Know the Grasshoppers, Cockroaches, and Their Allies. Wm. C. Brown Company, Dubuque. 353 pp. Josephson, R.K. 1985. The mechanical power output of a tettigoniid (Neoconocephalus triops) wing muscle during singing and flight. Journal of Experimental Biology 117: 357-368. Whitesell, JJ. 1974. Geographic variation and dimorphisms in song, development, and color in a katydid: field and laboratory studies (Tettigoniidae, Orthoptera). PhD dissertation. University of Florida, Gainesville. 75 pp. Whitesell, J.J., T.J. Walker. 1978. 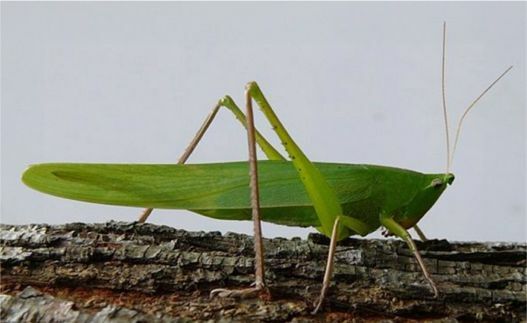 Photoperiodically determined dimorphic calling songs in a katydid. Nature 274(5676): 887-888.